Anyone can make money online with a website or a blog using Google AdSense. In fact it is a hugely popular way that people monetise their blogs and websites. Once it is up and running you can make passive income with Google AdSense while you sleep. Basically, if you create a Google AdSense account and embed the code they provide you into pages of your site, ads will appear on those pages. Advertisers pay for these ads and then leverage your traffic to earn money through the traffic your site generates. 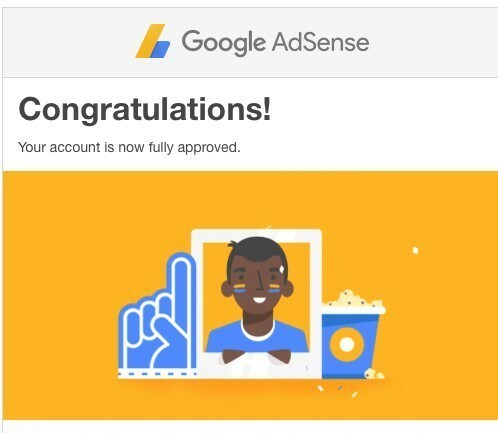 So whenever someone clicks on a Google AdSense ad that appears on your website, you will be paid for every click that you generate to their website. It is really a no-brainer to make some money using this method, given how easy it is. if you get rejected, don’t despair! Google will email you with a reason for the decline, and you can use this information to fix your problem and apply again. They don’t look upon you unfavourably if you need to reapply so keep at it. How much money will you make using Google AdSense? It all depends. Google AdSense pays more for keywords from a competitive niche. A competitive niche might be say VR technology – this would likely pay more than a site that provides free games. A click through worth a higher cost is worth more than lots of clicks at lower cost. However, both will make you money. What’s the difference between Google AdSense and Google AdWords? Google AdSense = when you advertise someone else’s products or services on your own website, and get paid whenever someone clicks. Google AdWords = when you advertise your own products or services, and pay each time someone clicks on your ad to see your product or service as a result of a google search. Signing up for Google AdWords is free. You pay when someone clicks your ad to visit your website, or contacts you. So you pay when your ad creates a measurable response. This is also known as pay per click advertising, or PPC. If you do not get clicks, leads or sales, then you don’t pay. The idea is that your ads appear on Google when people search for the things that you offer. You write an ad about what you offer, using search terms that will make your ad show in the Google results. If the words people type in Google match your keywords, your ad can appear above or next to the search results. Of course you will need to have an understanding of keywords. Wait, what? If you’re just starting out, how would you know that? The Google AdWords tool to help you with that is called Keyword Planner, it is free, and it helps you identify relevant keywords to incorporate into your ads to maximise your search results. Jaaxy will also help you with this. Jaaxy is a free tool provided as part of the Wealthy Affiliate set of tools. People know what they want when they do a search in google. So when they key in your keywords as their search, they see your ad. There is no better way of targeted advertising. How much does it cost to use Google AdWords? The budget that you set is up to you. You can also use Google AdSense if you are a YouTuber, although just this week YouTube have announced a change in their policy on advertising, favouring those who have greater subscribers and viewing hours. The YouTube Partner Program (YPP) now has an eligibility requirement of 4,000 hours of watch time within the last 12 months, and 1,000 subscribers. The change came into effect on 20 February 2018. Learn more about the YouTube Partner Program here. Like all things, there are advantages and disadvantages …. Google AdSense is quite selective in what it displays on your site. They want targeted views on their ads to continue being paid to advertise. You can earn an income while you sleep. You literally set it up and forget about it. Too many ads on your blog or your website will make it look spammy, and that can be a real turn off for people. Bombarding your readers with advertising is a sure way to get them to leave your site and not return. However, an ad here or there depending on your site is reasonable and most people don’t have a problem if they aren’t too in your face. You may want to pick and choose which pages or posts you place ads on. I would not recommend them on every page. You want your site to look clean and content driven rather than revenue driven. You will need traffic to your website for Google AdSense to make any money. As your site gains in authority and rankings, this will happen. If you aren’t technical (like me!) you may need a hand with the code. With that being said, I found an excellent tutorial within the Wealthy Affiliate community that answered my questions, so in the end I was OK. Does Google AdSense get the thumbs up? If you are wanting to make money online with a website that you already have, or make money working from home blogging or on YouTube, Google AdSense is a no brainer. Just make sure you don’t fill your site with ads. Be subtle. Use an appropriate mix of affiliate links and Google AdSense words. Depending on your affiliate links a click through can be far more profitable than a click on an ad. I am yet to purchase any AdWords, and if I do I’ll be sure to let you know how that works out for me.